Maybe it's my imagination, but it does seem that this year, for the first time in many years, there has been a noticeable increase in Christmas decorations and even utterances of "Merry Christmas" from checkout line clerks in the local stores. 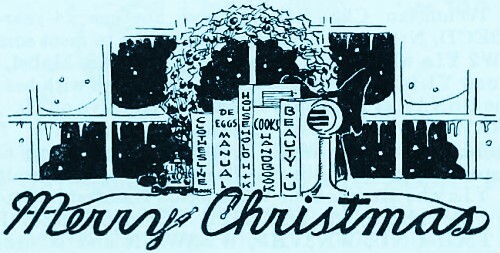 Magazines of yore used to be chock full of Christmas stories, holiday themes on the front cover, and advertisements with both religious and secular messages as part of the sales pitch. 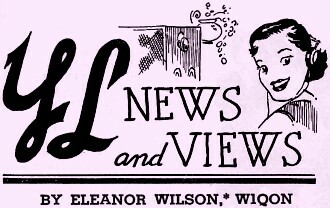 Take a look at the December editions of any of the vintage magazines hyperlinked in the upper right part of the RF Cafe header area to see what I mean. The December issue of QST for many years has published a cover photo of a traditional Christmassy New England winter scene that always includes a bright red cardinal. Vendor ads aplenty have Christmas themes. Same goes for my model airplane and amateur astronomy magazines. 4) the same YL may be worked on more than one band for additional credit. Incidentally, YLs interested in information concerning the YLRL are invited to write Miriam Blackburn, W3UUG, YLRL Secretary-Treasurer, Box 2, Ingomar, Pennsylvania. Read on for complete Party rules. Frequencies: All bands may be used. Cross-band operation is permitted, but only 'phone-to-'phone and c.w.-to-c.w. Eligibility: This contest is open to all licensed YL or XYL operators throughout the world (not restricted to YLRL members). 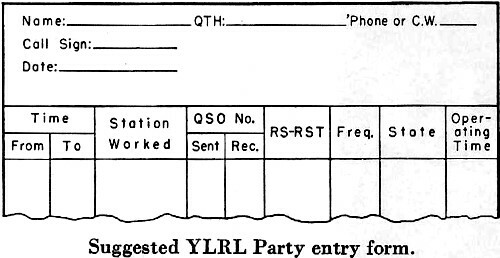 Contacts with OMs do not count - the YL-OM Contest will be held at a later date. Exchange: QSO number; RS or RST report; name of state, U. S. possession, VE call area, or country. Scoring: a) 5 points for each contact. Same YL may be worked on other bands for additional credit. b) Add number of points and then multiply by number of different states, U. S. possessions, VE call areas and countries worked. (Maryland and District of Columbia count as one state.) c) All 'phone contestants running 150 or less watts input at all times may then multiply the final score by 1.5. All c.w. contestants running 150 or less watts input at all times may then multiply the final score by 1.25. Awards: A cup will be awarded the highest-scoring entry in each category - 'phone and c.w. These cups are awarded on a yearly basis. Any operator winning the same cup three times gains permanent possession of it. Second and third place awards will be donated. Certificates will be awarded to the high scorers for 'phone and c.w. in each U. S. call area and in each country. 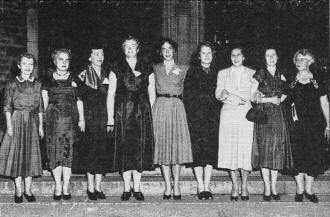 At Chicago on September 26th the LARKs (Ladies Amateur Radio Klub) bad their first annual installation dinner. 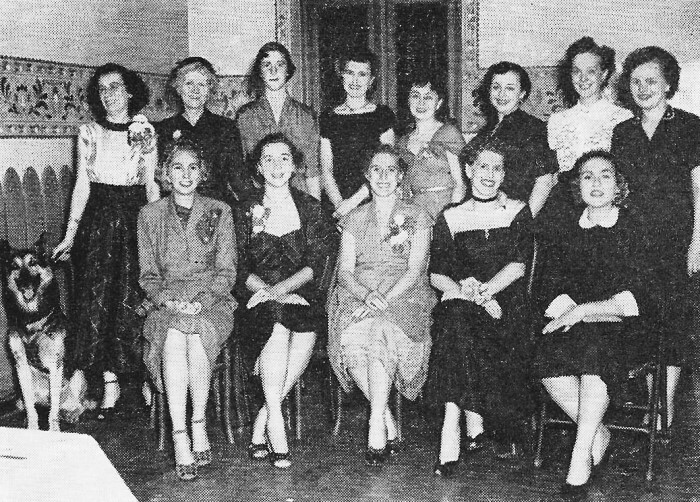 W9SJR, Bernice, was installed as President; W9IKS, Edna, Secretary; and W9LOY, Cris, Board Member. W9MYQ, Vice-President, was not present. YLRL President W1BCU was guest of honor. 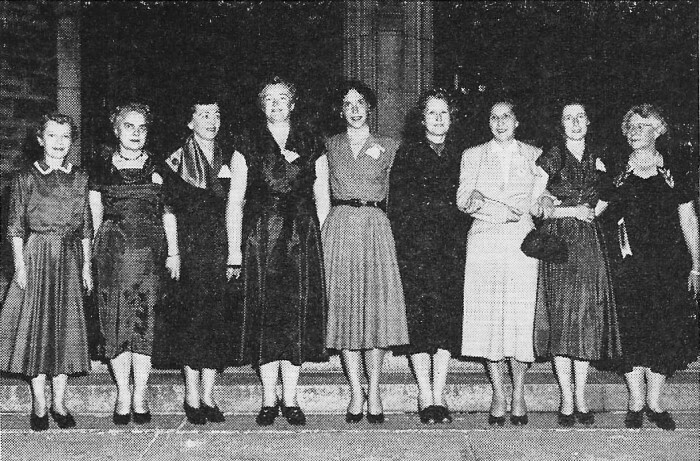 Standing, l. to r.: W9BCA, Helen; W9YWH, Evelyn; W9WOI, Jo; W9BCB, Helene; W9KQC, Virginia; "XL-in-waiting," Doris; W9YBC, Gloria; and W9SYX, Peggy. Seated: W9IKS, Edna; W9LOY, Cris; W1BCU, Peg; W9SJR, Bernice; and ham-soon-to-be, Stella. Nine YLs who enjoyed a variety of activities at the Eastern Canada ARRL Convention in Montreal, September 19th, are (l. to r.) VE2RK, Therese; VE2AOB, Stella; VE2CA, Phyllis; VE2NJ, Nancy; W1ZCS, Marie, of ARRL Hq. ; K2DRY, Emily; K2CBS, Ida; VE2AKK, Betty; and VE2HI, Ethel. 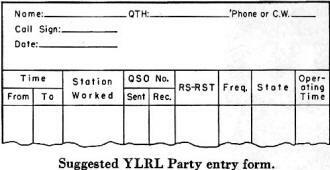 Here is information on the YLRL Nets revised and brought up-to-date as of October, 1953, by YLRL Vice-President W2OWL. All nets welcome new members to call in at any time. YLs interested in forming nets other than those listed are invited to write W2OWL. The XYL of W3SFA and mother of three young jr. 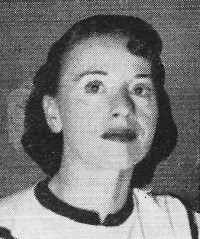 ops., Loreli Johnston, YLRL Chairman of the Third District, received her Novice ticket in 1951 and her General Class license in 1952. She holds an RCC, CPC for 20 w.p.m., is a CDS for North Pittsburgh and a member of various nets, including MARS. Operating 80 and 40 c.w. and 10 'phone, she particularly enjoys skeds with YLs and beginners in the Novice bands. OM W2SJV, reelected SCM of Western New York for a second term, appointed W2BTB, Jeanne, as his Assistant. ... W6CEE, Vada, is NCS for a new 75-meter 'phone net which meets Monday at 2:00 P.M. PST, on 3885 kc. ... The new call of ex-KL7AWL is W3WPP. "Carm" is now in Wash., D. C. ... W4JCR, Anita, writes that "Floridian prospective YL and OM hams and 'graduates' of the code class of W4TDK, Naomi, have voted her orchids for her excellent job in creating and maintaining an interest in obtaining their licenses." ... W5SPV, Pat, and W5SYL, Iva , are forming a YL club in the Dallas area. .... KN2DSL, Merceda Anna, age eleven, is a new YL in Bordentown, N. J. ... Fourteen-year-old K2CLC, Barbara, now has her Technician Class license, and another 14-year-old, KN2ECD, Nancy, of Brooklyn, would like to meet some of the W2 YLs who work 2 meters. ... W4LAS, Mabel, tells of a new YL in Puerto Rico. KP4WI, Millie, is with her OM in the USNAS at Roosevelt Roads and is active on 20. ... W0RAW, Bertha, is now operating "portable-five" from Arcadia, Texas. ... W3TYC, Miriam, is spending all of her spare time assembling a Heathkit AT-1 transmitter. ... YLs who attended the Washington Hamfest in October were W3s AKB CDQ LSX MSU OQF QBG RZD RXJ SLS TMH UXU, WN3VHF, WN3WWN and WN4ZBR. ... W3NNS, Annabel, received a 75A-3 from her OM for her birthday. ... W0ERR of Denver is on 40 and 10 regularly. Ann writes that two other YLs active in her city are W0JGU, Edna, and W0MYL, Florence. 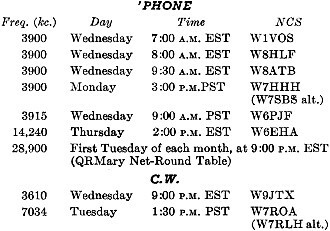 ... W5RTT, Virginia, and W5TTU, Pat, are active on 75; W0CXC, Mary Jo, is regularly on 40; and W5UXW, Opal, is on 10. ... K2ESO is the new call of ex-KH6AAO, Lee. ... WBATB, Esther, was a guest at the season's first meeting of the N. Y. C. YLRL Club. Esther spoke about the Flint tornado and the part fellow hams and she played in it. Esther and her OM, WBQBO, enjoyed visiting a number of YLs at their homes during their trip east in September. ... A record number of YLs attended the N. H. ARRL Convention at Concord on Sept. 13th. W1FTJ, Dot, Convention Vice-Chairman, presented each of the girls with a ceramic tile souvenir of New Hampshire. W1BCU and W1OAK, YLRL President and First District Chairman, respectively conducted the YL and YLRL meetings. Those YLs in attendance were W1s BCU FOF FTJ MDV OAK OIR OME QJX QON RLQ RYJ SVN TRE UBM UET UFM ULF UKR UZR VFK VOS VVS VYH VZD WIT WOY WTQ YFV YPG YYM YYU ZEJ, WN1WVT, W2KYF, W4AVA and W8ATB. ... W6EHA, Gen; W6JMS, Lucille; and W6WRT, Ruby, report a grand time attending the South Western Division Convention at Los Angeles in October. 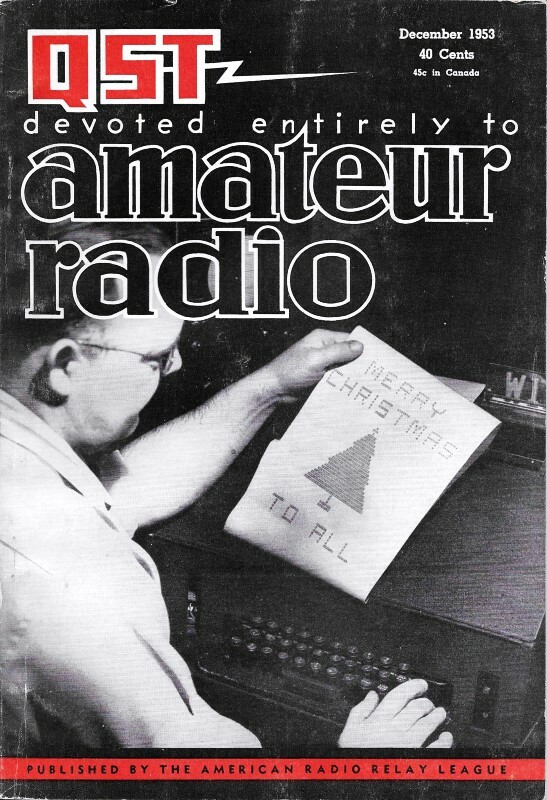 Most of the main trophies went to YLs, with the big one, an HT-20 and SX-71, going to W5RZJ; a complete mobile station to W6LBO; a Pfaff sewing machine to W6PPY; and a $50.00 credit for an antenna to W6JCA. YLs who enjoyed the various festivities of the Convention were: W5RZJ, W6s CEE CQV DQD DXI ERA GAI GKJ JCA JMC JZA KER KOY KYZ LBO LMQ MFP NLM OBZ PCO PJU PPY QGX QLM QOG QYL TDL UHA WRT WSV, KN6CAL, W8RPO/6 and WN8MHE.